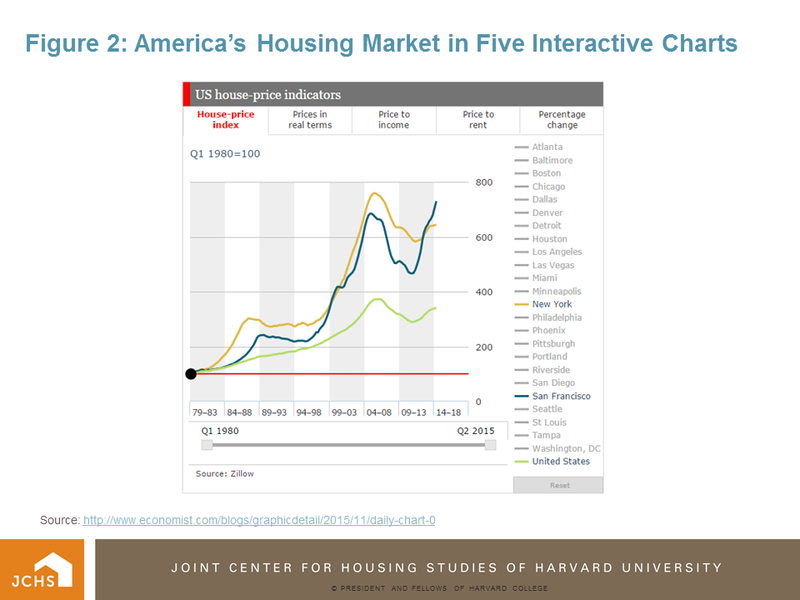 Housing Perspectives (from the Harvard Joint Center for Housing Studies): What Explains the Uneven Recovery in House Prices? What Explains the Uneven Recovery in House Prices? 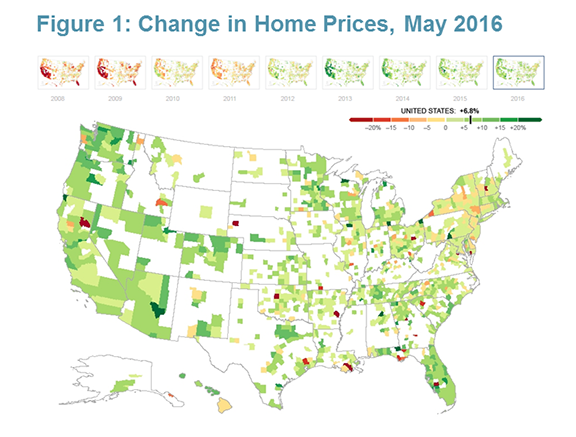 Our latest State of the Nation’s Housing report identifies the upswing in house prices since the Great Recession as one of the bright spots in the overall housing recovery, but emphasizes that the increase has been uneven for different parts of the country. This is clear at the county level in a series of annual maps produced by the New York Fed, available back to 2009. 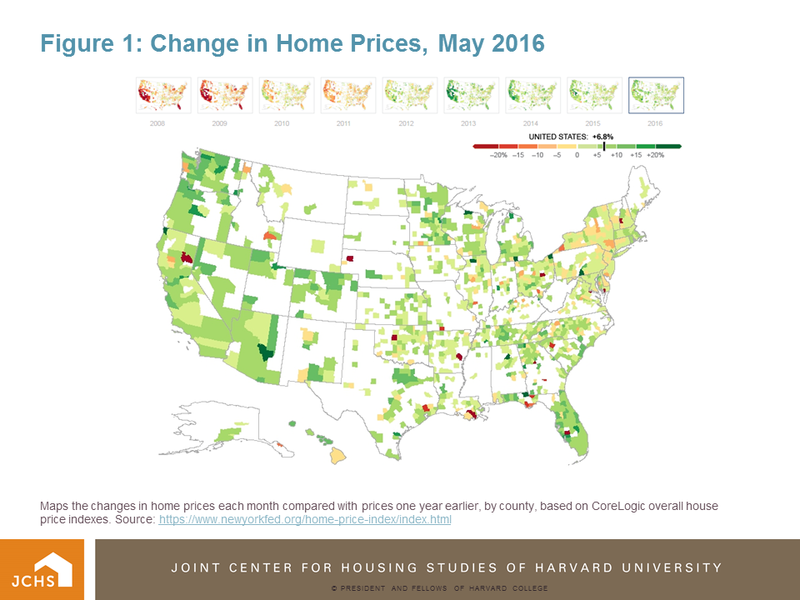 In Figure 1, which uses CoreLogic data, states in the far west, Colorado, and Florida are seeing significant increases in home prices, while the picture is more mixed in the Northeast and Midwest. 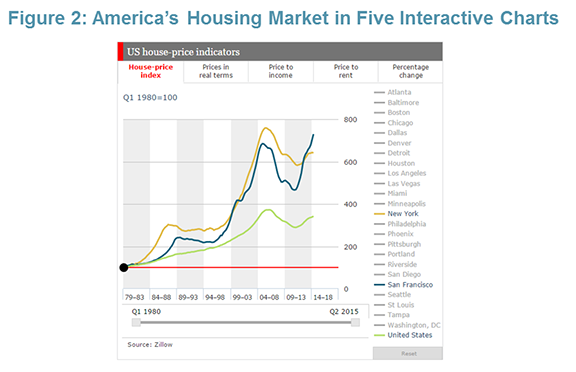 Greater depth on trends in house price indicators for 24 large cities using a different data source is available from The Economist in five interactive graphs. A longer time frame (going back to 1980), and additional information make The Economist graphs especially useful. In these (see Figure 2), the user is able to select various charts plotting 1980-2015 trends. Using the Zillow house price index, the charts show prices in real terms, the price-to- income ratio, the price-to-rent ratio, and the percentage change in prices. What is particularly useful is that trends in selected cities can be compared; the charts can be reconfigured by adding or removing individual cities and the user can change the start and stop dates by dragging quarterly date locators along the x-axis. This allows the user to focus separately on variability in price change during the pre-bust upswing, the Great Recession downswing, and the recovery. While differences in incomes and rents account for some of the variability in trends in the house price recovery among these 24 cities, we are unable to look at variability in trends in the supply and demand for housing in these cities. The Census Bureau recently updated their estimates of county population growth and changes in the housing stock, so we can add this information to the price data. For the principal counties of the 24 cities included in The Economist charts, both population and housing stock change during the recovery have been quite variable. Table 1 presents the percentage change between 2011 and 2015 in population size, the size of the total housing stock, and the gap between these changes. The cities are sorted from high to low on the gap. Denver has the highest population growth (6.6 percent higher than housing stock growth during that period), and Detroit has the lowest (population growth 2.4 percent lower than housing growth). Also included in Table 1 is the percent increase in house prices between 2011q2 and 2015q2 drawn from The Economist interactive chart. I have ranked the house price increase in order to demonstrate that the tightest housing markets (those with the largest gap between population and housing stock growth) also tend to be those with the highest price increases. Similarly, those with the smallest (or negative) gap show the lowest price increases. There are several cities that are counter to this generalization, and I have highlighted three that deserve further comment. Washington, DC has the second largest gap between population and housing growth, but ranks 17th in price increase during the recovery. During the boom in housing prices between 1998 and 2006, Washington, DC increased by 120 percent, from a median price of $229.4K to $505.5K. This compares to a 42 percent increase for the total US. Subsequently, the downturn between 2006 and 2011 saw DC’s median price decline by 36 percent, to $322.8K. But this is still over 40 percent higher than the 1998 value. The percentage rise in median price during the recovery is just above the US average at 11.5 percent. Still, the median home price of $360K in DC is now twice the national average – about the same as Boston and Seattle. Young adults who move to Washington to take government jobs and internships have heavily fueled the area’s recent population growth, but they are less likely to become homeowners and drive prices even higher. Detroit, at the other extreme, has had negative population growth during the recovery, but the 6th highest percent increase in housing prices. However, Detroit’s price trajectory is somewhat unique. During the national run up in prices between 1998 and 2006, median home prices in Detroit increased only 4.1 percent – a tenth of the national average – from $172.6K to $179.6K. The Great Recession saw Detroit’s median price fall by more than half, to $83.3K in 2011. The recovery rise to $116.6K in 2015 still places the median price at just 59 percent of the 2006 value. The only reason the percentage rise since 2011 is a relatively high 39.9 percent is that the starting point is so low. San Francisco is the third city that deserves further comment. 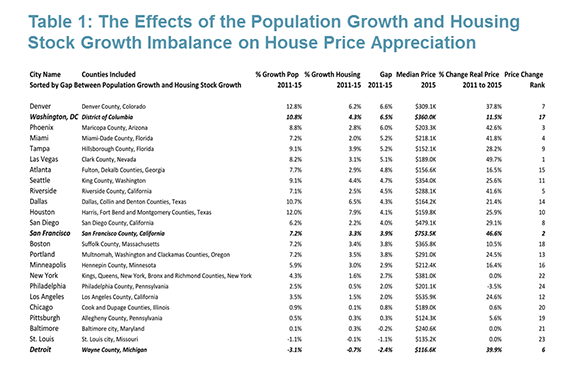 While in the middle of the pack on the gap between population growth and housing growth, it ranks second in price increase during the recovery. San Francisco has, by far, the highest median house price among those cities listed in Table 1. At $753.5K, it is $275K higher than San Diego, the next highest city, and over four times the national average. We would need to examine factors other than population growth or median income growth to account for the city’s unique position. Low vacancy rates, increases in income levels that fall well above the median, the high ownership rates of Asians (who make up a large share of San Francisco’s population), and perhaps even foreign ownership increases (similar to trends in New York City), would likely need to be considered. With these caveats in mind, Table 1 makes a strong case for the gap between recent changes in supply and demand exerting a strong upward pressure on house prices. Except for DC, six of the top eight cities with the biggest gap rank in the top ten for percentage price increases. And except for Detroit, six of the bottom eight cities with the smallest gap are ranked in the bottom for price increases during the recovery. Houston and Dallas are both in the middle of the pack on price increases, despite being near the top of the list on population growth. The key here is that they also lead the 24 cities in growth in their housing stock. 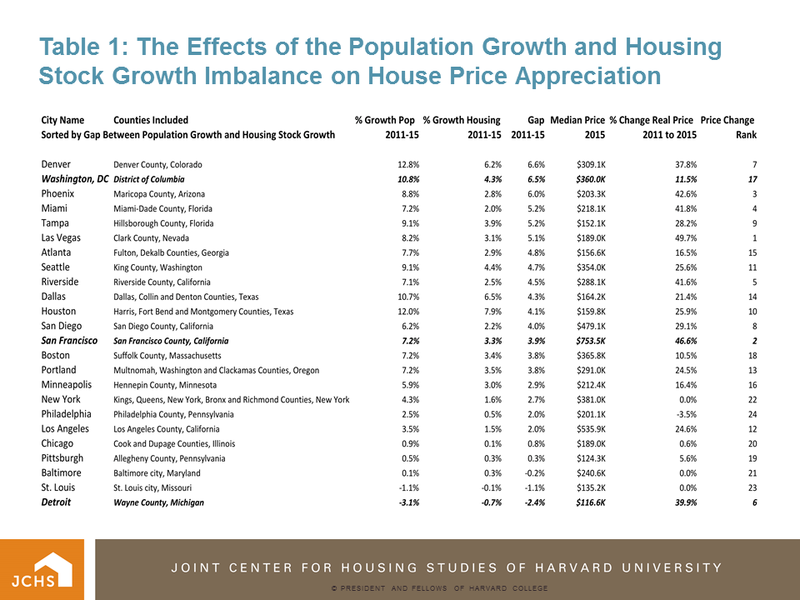 None of this should be surprising, of course, but it doesn’t hurt to remind ourselves of the overriding importance of the imbalance between population growth and housing stock growth in explaining trends in prices.